Pamela is a solicitor in the Commercial and Business team at Hayes Solicitors. She specialises in commercial litigation and dispute resolution acting for financial institutions, private equity funds, private companies and individuals in a variety of matters including enforcement and recovery actions, landlord and tenant disputes and general litigation cases. Pamela also provides advice on a wide range of commercial and business law matters, including data protection law and the review and drafting of commercial contracts. 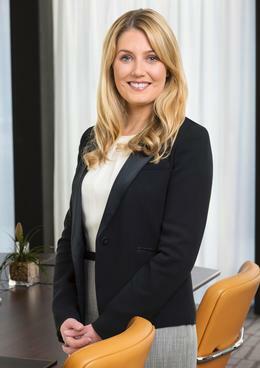 Prior to joining Hayes, Pamela worked in the commercial litigation and insolvency department of another leading Dublin firm acting in a range of commercial litigation and insolvency matters with a particular focus on acting for receivers in highly contentious injunctive proceedings, advising Official Liquidators in the performance of their statutory functions, and examiners and all stakeholders in the examinership process. Represents various financial institutions in the Circuit Court, High Court, Commercial Court, the Court of Appeal as well as the Supreme Court in cases which include claims for summary judgment, enforcement and the realisation of security to include the appointment of receivers and petitioning for bankruptcy. Regularly advises clients in relation to all aspects of commercial disputes to include injunctive relief applications, property disputes and claims for breach of contract. Acted for numerous voluntary and court appointed Liquidators, Examiners and Receivers in respect of all aspects of relevant insolvency law. Advised a well-known Irish financial institution in relation to a high-profile breach of contract and specific performance dispute in the Commercial Court. Experience in a number of successful non-binding arbitrations and court recommended mediations regarding summary judgment. Pamela is the author of the cover page article in the Law Society Gazette issued in March 2018 in relation to the on-going difficulties surrounding the registration of a lis pendens procedure.